True cuisine for your Baby. Cooking ingredients separately is the secret to healthy and tasty cuisine. With Nutribaby, ingredients are cooked separately: all you need to do is start cooking the foods that need to cook for the longest time in the 1st basket, then add the other ingredients to the 2nd basket a few minutes before the end of the cycle. Accordingly, each ingredient cooks for the right amount of time and the baby benefits from all the vitamins and enjoys the correct flavors. Biggest capacity on the market with a capacity of 6 ¼ cups cooking and 2 ½ cups blending it is ideal to cook for several days or for several babies at the same time. Nutribaby is saving you time in the kitchen and giving you more time to hang out with your little ones. 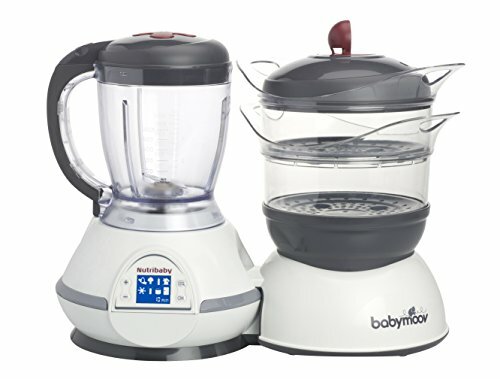 The only baby food processor with 5 different functions: steam, blend, sterilizes (up to 3 full size bottles), defrosts and warms. All the functions are easily managed via its LCD screen. Since it sterilizes and warm bottles Nutribaby can be use from birth, and this makes it the perfect baby registry item. Nutribaby also comes with a spatula and a recipe book to guide you to do real cooking for Baby! Want more? Go on the Nutribaby app: Cooking Baby Food and find your next favorite recipes www.cookingbabyfood.com Parents driven innovation Since 1997, Babymoov reinvents the everyday life of parents by providing reliable, highly designed and technologically advanced products driven by parent’s input: focus group with mums, meeting with a committee of experts and observation days in our own daycare-nursery Lifetime Warranty: Trust is essential when it comes to baby equipment and Babymoov is committed to offering safe and high quality products and offers a lifetime warranty on all of its products. EASY TO USE: The LCD display and audio alerts make operating the Nutribaby a breeze. It is fully programmable and alerts you when done. If you have any questions about this product by Babymoov, contact us by completing and submitting the form below. If you are looking for a specif part number, please include it with your message.